What’s wrong with Rogaining? I reckon there is nothing wrong with rogaining. I love the sport and I have been happily competing for 23 years now and I am looking forward to giving the Super Veterans a run for their money when I qualify next year. So I am probably the wrong person to answer this question. This graph tells us that about half of all rogainers only ever attend 1 event and few rogainers ever compete in more than 4 events. Why do few rogainers ever attend more than 4 events? I do not know. What I do know is that while rogaining participation rates have been growing gradually, participation in other adventure sports have been growing exponentially. What I also know is that most rogainers prefer the shorter events. This year’s NSW Champs was a fabulous event but only 81 people took the field for the 24 hour Championship event and numbers for the NSW Champs have historically been well less than half the number that attend the Paddy Pallin event each year. I am on the NSW Rogaining Committee and contributed to the Strategic Plan, so I think this Strategic Plan embraces a series of strategies that we need to put into place to improve the participation rates in our sport, but I would love to hear from those with other ideas. I would also love to hear from those who think these are the right set of strategies to improve participation rates in our sport. I do not remember much about studying ancient history at school but I do remember the class structure of Ancient Greek society and the “Pentacosiomedimni” whose wealth can be defined as being greater than 500 bags of wheat. Like Ancient Greek society rogaining has its own class structure, of which I have been a student for more than 20 years. For those of you who have noticed the different classes but have been unable to put you finger on the differences, or have confused them for competition categories, read on and I will de-mystify them. The lowest class in rogaining society is the carefree. You can tell The Carefree because they are actually enjoying themselves. They do not care much for the point score, they are out for a day’s walk enjoying the weather and the scenery. You can tell The Carefree because they score about 1/10th of the winner’s score and are smiling before, during and after the event. They are sometimes accompanied by children and often camp at the events, enjoying the conversation around the campfire as much as scoring points. The Carefree use the whole event as a excuse to go camping with the bunch of others. The Carefree might be regular participants at events, however are quite content to leave mid event if the timetable does not suit them. They do not wear gaiters since they are not required. The Carefree are not interested in climbing the rogaining social ladder and can be described at “earthy” or “spiritual” people. They will stop mid rogaine and have a three course lunch. The Casual rogainer can be easily differentiated from The Carefree because they care about their point score but not enough to improve their rogaining. The Casual rogainers will attend at most two events a year and only then if they are held in convenient or attractive locations. These people enjoy rogaines but would not really call themselves rogainers or list it as one of their past times on their cv. The Paddy Pallin events attract a lot of casual rogainers. Casual rogainers will compete to the finish of the event but probably not stay for the awards. They might or might not check their score on the web site over the next few days. Casual rogainers will take a full meal for lunch and stop and eat it. They also take regular stops throughout the event. The Competent are the back bone of rogaining. They know how to use their compass but prefer straight lines to contouring on the course. Typically the competent will attend 10-15 rogaines over their lifetime and score somewhere between half and 2/3 of the winner’s score. The Competent do not run and do not do night rogaines since both of these activities seem pointless or too hard. The Competent will stop briefly for lunch or dinner during the event. The Committed list rogaining as one of their hobbies on their cv. Typically they go to 4 or more events each year and will do more than 20 events in their life time. The committed probably train for rogaines and can be seen studying their rogaining map for days after the event. The Committed do not throw out their rogaining maps and keep them forever and sometimes break them out to show friends. The committed usually score around 2/3 of the winners’ score and one day hope to make the podium. The Committed will only rogaine with someone of similar ability since they do not want to be slowed by a less capable partner, no matter how good looking they are. The Committed are jealous of The Crazys and want to join their ranks but either their body fails them or they have job or family commitments which prevent them from doing 10 hours of bush running each week. The Committed may be seen running part of an event but do not have the legs to run for more an hour or so. The Committed love night navigation because it gets them closer to The Crazys who can not run as quickly in the dark. The Committed hate to stop during an event and will only do so for a nature break or a food stop if they are forced to. The Crazy are easy to recognise, they are the ones on the podium. They are the ones that actually win events. The Crazies do not attend events unless they have a free weekend between climbing Mt Everest naked or swimming the Nile with lead weights around their arms and legs. I first identified The Crazy as a class of rogainers during the 1995 Australian Champs. The event started at midday and it bucketed down rain for seven hours. One of my team was suffering hypothermia and we had all had a gut full when we gave it away about midnight. I remember sticking my head out of my tent about 2am and I saw a team jogging on it way to the next control. At this point I realised the existence of The Crazy class of rogainers. The Crazys are the ones who run for the entire event and measure their distance covered to the nearest 10 kms. The Crazys do not eat anything other than gel and protein bars during an event. It is easy to identify The Crazys at an event they are the ones dressed in running gear at the start of an event. Understanding the social structure of rogaining can give you valuable insights into the people and their preferences. Look around the car park at an event, for example, and you will be able to identify from which class the owner belongs. For example if you spy a Prius, A Hyundai or a Kia it probably belongs to one the The Carefree, who do not want to work too hard and are not out to impress, other than with their green credentials. If you see a luxury European car it is likely to be driven a member of The Casual class of rogainers. More experienced rogainers would not risk bring a nice car along the roads lead to a rogaine. One of The Competent class would probably drive a sensible family car, possibly a four wheel drive but one that you would be happy to take to golf or church. The Competent may well have a nice European car in the garage at home but would not risk bringing it to the event. The Committed will usually drive a serious four wheel drive car to the event. They spend a lot of time in the bush and need a capable car. If you see a crappy car in the car park at a rogaine it will probably belong to one of The Crazys. There are several reasons for this. Firstly, The Crazys spend so much time training and competing that they do not climb the work totem pole very well and can’t afford a flashy car. Secondly, The Crazys would prefer to spend their money on a carbon fibre paddle for their racing kayak or on air tickets to compete at an event in Ulaanbaatar. Thirdly the Crazys experience little no joy from possessions, their pleasure is derived from beating everyone else on the sporting field. The good news is that you can move between classes, although once you are a part of The Crazy you normally staff there. As they grow old they win veteran, then the super veteran and ultra veteran category at events, they do not usually move down in class. The Carefree also do not often move classes competition is not really in their DNA and have no desire to chase a point score. There is however regular movement between the other classes. A member of The Casual may move to The Competent and ultimately to The Committed. Equally a member of The Committed class may move to be a member of The Casuals as family time pressure lessens their commitment. I am a member of The Committed. I wish I was good enough to be one of The Crazys but I have never found the training time and now I am have more time in my mid 50s my body is starting to limit my potential. I have only been a member of The Committed for the last 5 or so years. For the 18 years of rogaining before that I was a member of The Competent. 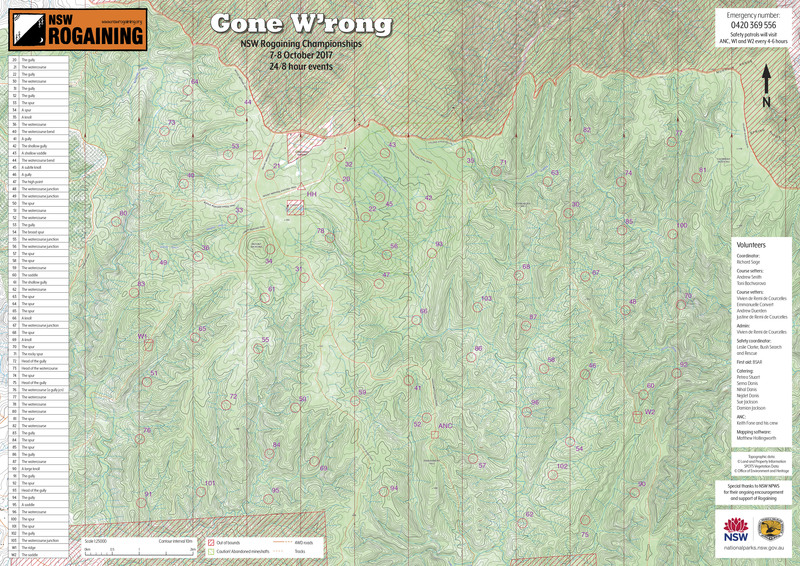 Here is a great example of the difficult country that the top teams encountered on the eastern side of the course. Which route would you choose between 70 and 92?